The KPI Institute is excited to announce the newest media partner – Mid-East.Info. Our cooperation will emerge at the first GCC edition of the Performance Improvement & KPI Conference in Dubai, United Arab Emirates, taking place on 17th – 20th October, 2016. 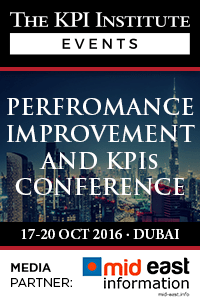 The Performance Improvement and KPI Conference represents a unique, premiering event dedicated exclusively to Performance Management & KPIs in three important contexts. Government & Healthcare Performance along with Productivity, Quality & Innovation Performance are some of the most requested streams that The KPI Institute wanted to approach in this event. Nowadays, the business and economic environment in Middle East draws attention to its dynamic character and the transformations that continued to occur over the past years. These changes required organizations to adapt and develop new strategies in performance management, beneficial to supporting professionals in overcoming the challenge of progressing alongside with the leading competitors and technological advancements. The KPI Institute and Mid-East.Info share the common goal and vision of offering professionals in the Middle East a brand new platform that allows them to broaden their perspective on today’s economic environment and also creating competitive advantage through unique solutions. Mid-East.Info is an online portal providing instant business news and information covering all industries from the Middle East region. Over the past years, The KPI Institute delivered performance management educational programs and executive seminars to more than 500 professionals from top organizations such as National Bank of Fujairah, Salalah Methanol Company, Kuwait Institute for Scientific Research, Dubai Health Authority, ARMA and more, in countries like Kuwait, Oman, Qatar, Egypt, Bahrain or UAE. Since then, our efforts were continuously focused to bringing new opportunities to the community. This conference gathers top-notch speakers like Aurel Brudan, CEO, The KPI Institute, Australia; Cameron Mirza, Head of Strategy and Projects, Ministry of Education, Kingdom of Bahrain; Kim Warren, CEO, Strategy Writer, Strategy Dynamics Ltd; Mohamed Moustafa Mahmoud, Senior Advisor to the Minister, Ministry of Economy and Planning, Saudi Arabia; Moshen Ba-Abdullah, Executive Director ICT, King Abdullah Medical City, Saudi Arabia or Khalid Alswat, Vice Dean Quality, King Saud University Medical City . The Performance Improvement & KPI Conference in Dubai expects the participation of a high profile list of professionals such as CEOs, Chief Strategy Officers, Chief Transformation Officers or Chief People Officers concerned with Government and Healthcare Performance, Productivity, Quality or Innovation and willing to engage into interactive pre and post conference workshops. You have the opportunity to interact with over 100 participants in 40+ insightful sessions, engage in 6 cutting edge workshops and get to know over 30 speakers and trainers.